Sir Andy Murray today revealed he had shared a ‘big cuddle’ with his mother after emotionally announcing that he is planning to retire after Wimbledon. The former world number one tennis star has battled to recover from a chronic hip condition for more than 18 months, undergoing surgery in Melbourne a year ago. But he was forced to admit in a tearful press conference earlier today that he was still struggling and next week’s Australian Open could be his final tournament. 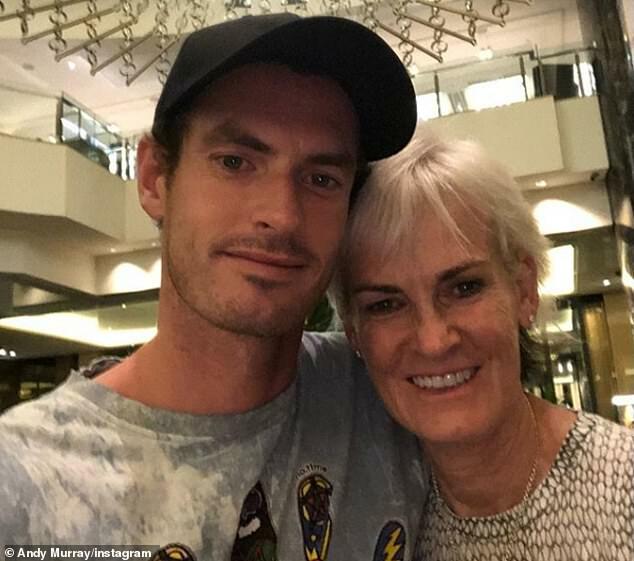 After an outpouring of support from sports fans, Sir Andy posted a picture of him smiling with mother Judy, 59, who has been the driving force behind his career. 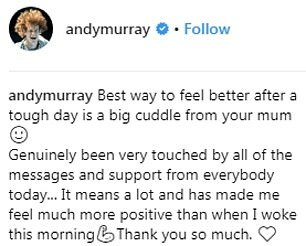 The 31-year-old double Olympic champion from Dunblane wrote on Instagram: ‘Best way to feel better after a tough day is a big cuddle from your mum. 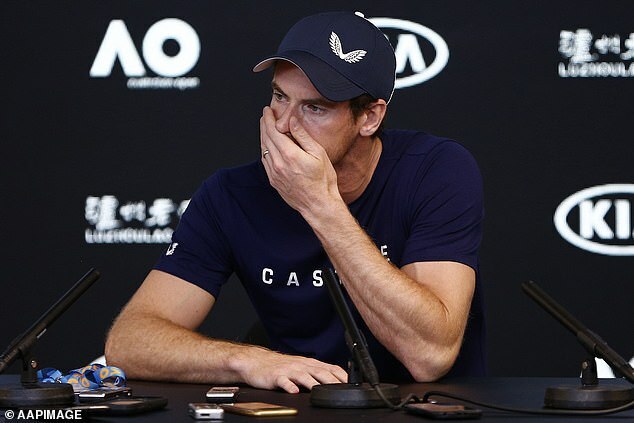 Sir Andy was on the verge of breaking down as he entered the press room earlier today and, asked how his hip was feeling, only managed to say ‘not great’. He was then overcome by his emotions and had to leave the room, before returning after several minutes to deliver his devastating news. 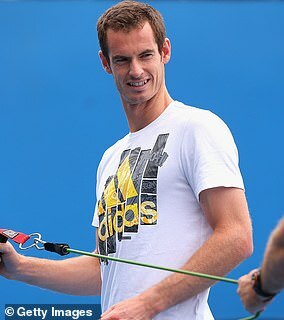 Sir Andy said: ‘Obviously I’ve been struggling for a long time. I’ve been in a lot of pain for about 20 months now. 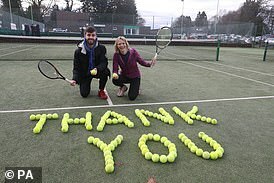 Residents of Dunblane have hailed the tennis career of the town’s most famous son, and wished him a bright future when he lays down his racket. The Scottish town near Stirling where Sir Andy Murray grew up has become synonymous with the tennis star. 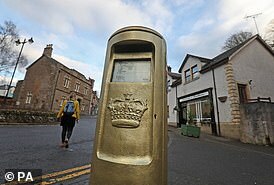 A golden post box stands in the High Street in recognition of his Olympic win in 2012, and the court at the local sports club is rarely without young Wimbledon hopefuls hitting some balls, inspired by the 2013 champion. Local resident Bill Drummond, 71, said of Sir Andy’s decision to retire this year: ‘I think it’s the right thing to do – he’s a young man, he’s got the rest of his life ahead of him. ‘If he doesn’t take care, it will affect him. I just wish him well. He’s done so well to get to where he has. It’s good to think of the good he’s done, and the future he’s got ahead of him. ‘He can look back on his past feeling he’s achieved so much, and got so much to look forward to. ‘He’s been great for Dunblane. Dunblane was remembered for all the wrong reasons – we used to go on holiday and we’d try and avoid saying where we were from. But latterly it was hailed as Andy Murray territory, so it’s been amazing for the town. ‘He’s done great for Dunblane, for Scotland and tennis. We’ve always watched tennis, but for him to be part of it, it meant so much more. Sir Andy will contest his first-round match against Spain’s Roberto Bautista Agut on Monday but that may prove to be the final match of his illustrious career. The 31-year-old said: ‘I’m going to play. I can still play to a level. Not a level that I’m happy playing at. But it’s not just that. ‘The pain is too much really and I don’t want to continue playing that way. ‘During my training block (in Miami last month) I spoke to my team and told them I can’t keep doing this. ‘I needed to have an end point because I was sort of playing with no idea when the pain was going to stop. After another pause while Sir Andy sat with his head on the desk, he was asked whether this might be his last tournament. ‘Yes I think there’s a chance of that for sure because I’m not sure I’m able to play through the pain for another four or five months,’ he said. ‘I have an option to have another operation, which is a little bit more severe than what I’ve had before in having my hip resurfaced, which will allow me to have a better quality of life and be out of pain. The hip problem first emerged after his French Open semi-final loss to Stan Wawrinka in June 2017, although Sir Andy revealed as he limped through Wimbledon that he had been managing a condition for a number of years. 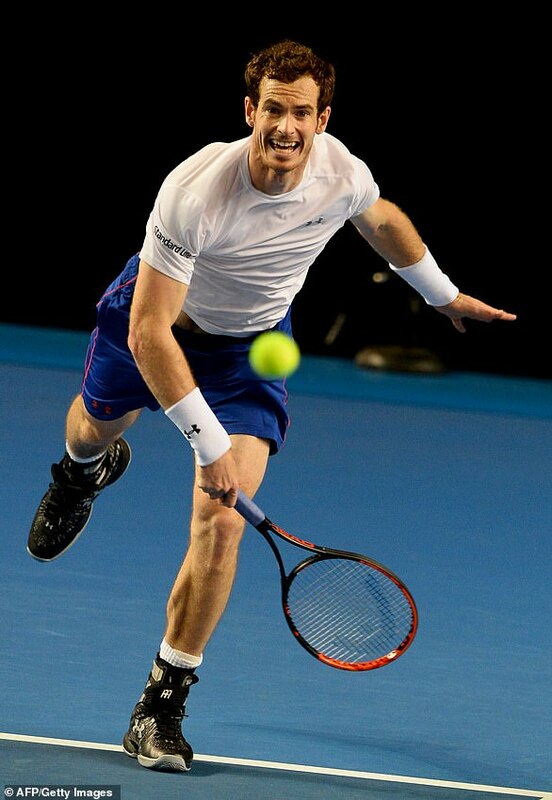 ‘I have a severely damaged right hip,’ said Sir Andy. ‘Having the operation last year was to give it the best possible chance of being better. ‘I have been playing with hip pain for a number of years, it wasn’t as if it just started at the French Open after my match against Stan. ‘It got to a level where I didn’t recover from that match, pushed it over the edge. ‘Having the operation would hopefully make it as good as possible. It didn’t help with the pain at all. ‘There are certain things on the court I cannot really do properly now, but the pain is the driving factor. ‘I can play with limitations, that’s not an issue, it’s having the limitations and also the pain is not allowing me to enjoy competing, training or any of the stuff I love about tennis. It is especially cruel that the problem emerged only a few months after Sir Andy ascended to the top of the world rankings, cutting short a career that looked like it had a lot more to give. But, even if he does not win another match, he will go down in history as Britain’s finest tennis player and one of the country’s greatest ever sports stars. 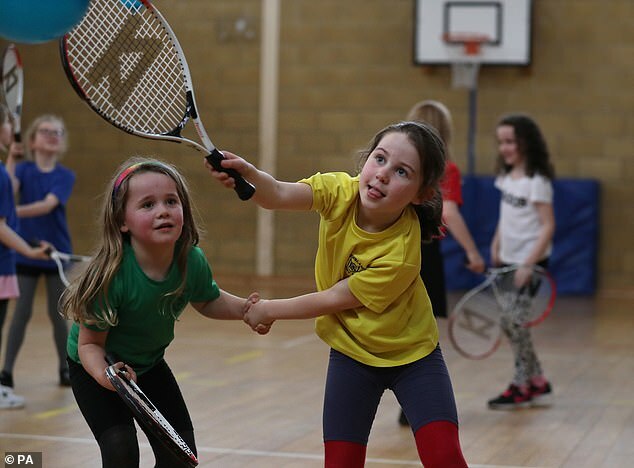 Sir Andy’s former tennis coach, Brian Melville, 68, paid tribute to the sportsman’s efforts to get youngsters onto the courts at the Dunblane Sports Club near Stirling. Mr Melville, who is now retired, said: ‘It was no surprise because he’s been struggling for the past couple of years. He has to think about his health. ‘He’s achieved everything in tennis. I know he would like to do it again but it’s not possible. He’s got more people playing the game here, and I hope, on other courts as well. 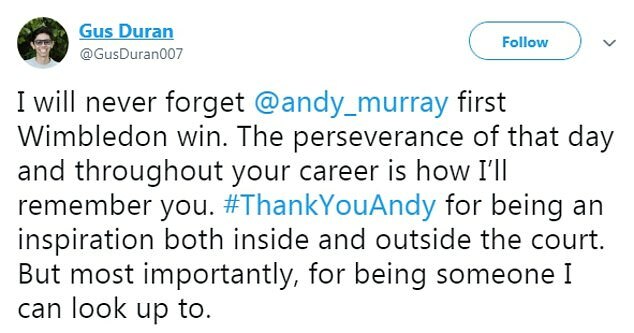 The appreciative British public were quick to praise Sir Andy on Twitter today, sparking the hashtag #ThankYouAndy and lauding him for not only his sporting accomplishments but also his work as a role model. But not everyone was so touched by his speech, with TalkSport presenter Alan Brazil causing a storm online after mocking the tennis star for ‘blubbing’. Many congratulated him on his successful career, in which he won three Grand Slam titles, two Olympic Gold Medals and the Davis Cup with Great Britain in 2015. Others mocked up memes and pictures to celebrate his accomplishments, even superimposing his face on Mel Gibson from Braveheart. Writing on Twitter, Gus Duran said: ‘I will never forget @andy_murray first Wimbledon win. Stefan Gamlich added: ‘Cheers @andy_murray, You made history! The game will not be the same without You… #AndyMurray #AUSOpen #ThankyouAndyMurray #ThankYouAndy’. And another Twitter user wrote: ‘Thank you Sir Andy. One of the greatest sportsman Scotland has ever produced. But others highlighted his efforts to stand up for gender equality, calling for more women to get top jobs in sport and regularly calling out journalists for overlooking female players. Sir Andy, who has two young daughters with wife Kim, has also spoken of wanting them to have the same opportunities as men in their careers and lives. Dan Chisholm wrote on Twitter: ‘I don’t imagine Andy Murray will see this among thousands of messages but while this is such a tough decision, nothing can take away his place in history. 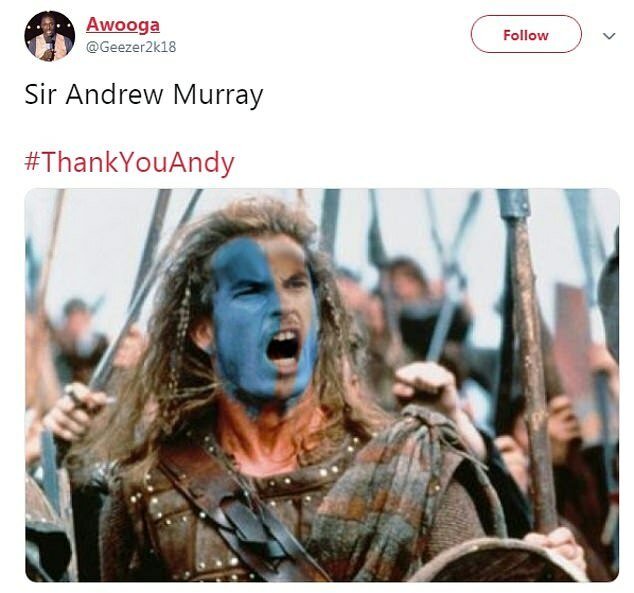 Sir Andy is also well known for being a passionate Scot – and was criticised early on in his career for saying he would want ‘anyone but England’ to win the 2006 World Cup. He quickly won back fans south of the border with his efforts on the court, but continues to be an icon in his home country. Scottish First Minister Nicola Sturgeon led local praise after watching his announcement in an emotional press conference. 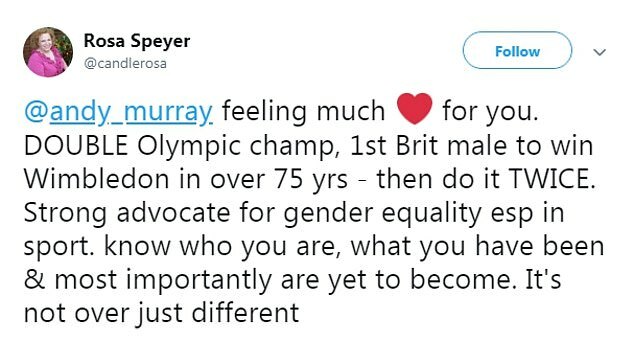 She tweeted: ‘Andy Murray is a legend – without doubt one of Scotland’s greatest ever sportsmen, as well as an outstanding role model and inspiration for young people everywhere. 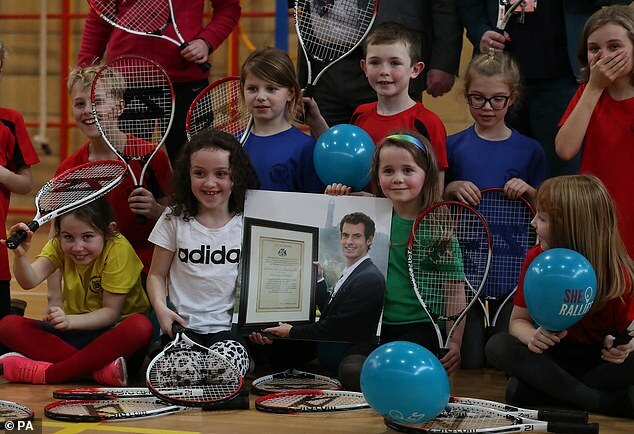 What could Sir Andy do when he retires? After dedicating his life to his on-court pursuit, Sir Andy will now begin a new chapter as he looks to his future. So what might the 31-year-old do next? 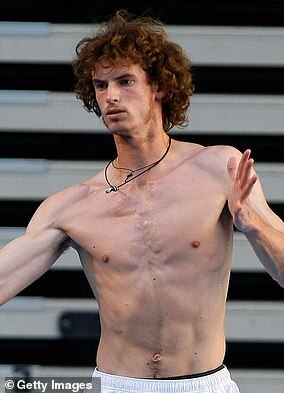 Although he would not have expected it to come so soon, Murray has been planning for life off the court for some time. He set up his sports management agency, 77, with business advisers Matt Gentry and Gawain Davies in 2013 and has signed up a number of young athletes, among them tennis players Aidan McHugh and Katie Swan. Murray is unlikely to become a travelling coach, at least in the short term, but mentoring young professionals and helping them avoid some of the pitfalls he suffered is something that motivates him. Murray has an interest in business and technology and partnered with equity crowdfunding platform Seedrs in 2015. The Scot focuses on investing in start-ups and told Forbes last summer that he has stakes in more than 30 ventures. Property is another interest. Murray bought Cromlix House hotel near his home town of Dunblane in 2013, turning it into a luxury venue. Murray tried his hand at punditry as he sat out last year’s Wimbledon and, unsurprisingly, proved a natural. Often depicted as dour and boring, the Scot in fact has a dry wit and easy manner, and his encyclopaedic knowledge of tennis and intelligent analysis would make him a very welcome addition to the world of broadcasting. He has no huge desire to be in front of a camera, and the length of the match he commentated on between Rafael Nadal and Juan Martin del Potro was an eye-opener, but he may dip in and out like Tim Henman. When Leon Smith decides to relinquish the reins as Great Britain captain, who better to step into his shoes than the man who carried his country to the 2015 title virtually single-handed? Murray has always loved the team environment and would surely prove an inspirational figure. With the restructuring of the competition meaning fewer ties, it would be a manageable commitment. Scottish Labour leader Richard Leonard also called Sir Andy ‘one of our country’s greatest ever sportsmen’. Tracey Crouch, the UK sports minister when Sir Andy claimed his second Wimbledon title in 2016, said she was ‘sorry’ to hear of his retirement. She added: ‘He’s such a phenomenal competitor in an era of other great players, a champion for equality in sport and a genuinely nice guy. As well as his glittering tennis career, he was also hailed by Labour MP Jess Phillips for being a ‘normal bloke, and best of all casual feminist’. His decision to appoint Amelie Mauresmo as his coach in 2014 was considered a groundbreaking moment in the sport. Questions have been raised over what will come next for Sir Andy, who already acts as an official mentor for young sports men and women through his management company. The programme even reaches his beloved Hibernian Football Club, where two players are under the Grand Slam winner’s stewardship. In a tweet from Hibs’ official account, head coach Neil Lennon said: ‘Andy Murray is an inspiration and a role model. He’s been the ideal mentor to Fraser Murray and Ryan Porteous. 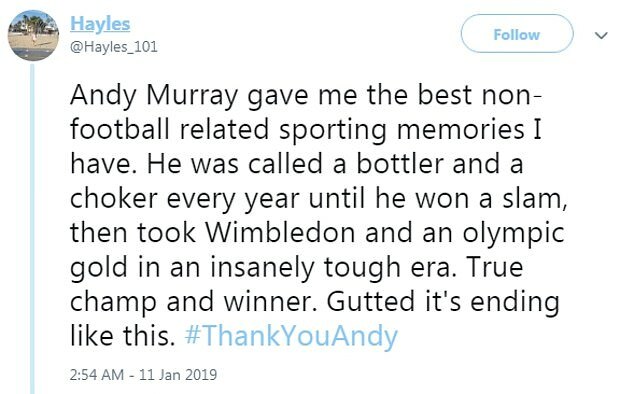 Meanwhile Scottish drinks company Irn Bru tweeted its own tribute with an old picture of Sir Andy sipping from a bottle with the simple caption: ‘Here’s to you, @Andy-Murray’. And the official Wimbledon Twitter account tweeted an image of two-time winner Sir Andy celebrating victory on Centre Court. A budding tennis star at Sir Andy Murray’s former school hopes the Wimbledon champion will return as a PE teacher after he retires. Dunblane Primary School pupil Gregor Wood said he was shocked to hear of Sir Andy’s plans to leave the game this year due to ongoing injury, but the youngster already has high hopes for what the tennis ace might do next. The youngster met Sir Andy when he returned to his old school for a visit, and he said the Wimbledon champion was ‘quite laid back’ and told the pupils he hoped some of them would follow in his footsteps. Gregor hopes to be able to do so as his tennis is ‘quite good’, and he credited Sir Andy’s determination as one of his most inspirational qualities. Fellow P7 pupil Katie Cullen also met the tennis star when he returned to the school, and she said he was ‘funny’ and ‘very inspirational’. She added: ‘I was quite sad and shocked that he was retiring but still happy that he’s going to be able to rest his hip and not have to worry about competitions. Headteacher Lorraine Slabbert said she is ‘hugely sad’ Sir Andy plans to retire this year as he has been a ‘huge inspiration’. 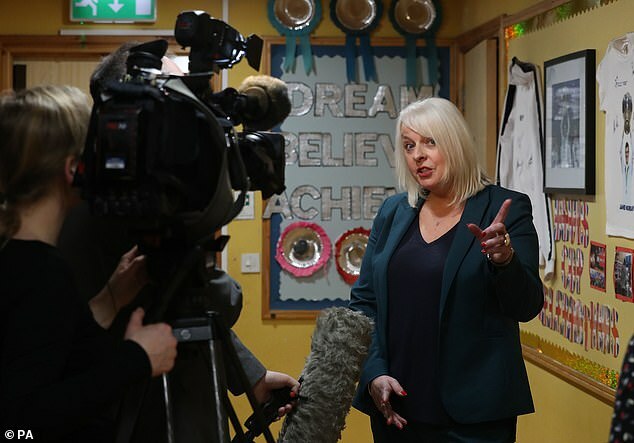 She added: ‘However with everything we do in Dunblane we talk about a positive spin on that, and actually my thought immediately was ‘what’s next for him and what more impact can he have’? She said his visits to the school had shown pupils how to live active lives and taught them they can ‘do anything they want to do’. Stirling Council leader Scott Farmer met Sir Andy when he was given the freedom of the city in 2014, and said he was ‘very nice’ and ‘unassuming’. Mr Farmer said he is sad about a ‘premature end to a spectacular and outstanding career’. Andy Murray’s spectacular tennis career appears to be coming to an end after he announced on Friday he would quit the sport after struggling to overcome a hip injury. The former British and World No 1 said he would retire after this year’s Wimbledon in an emotional press conference in Australia, though he admitted he may not make it that far. Over the course of his career Sir Andy has won three Grand Slams, two Olympic gold medals, one ATP Tour Finals, a Davis Cup, finished 2016 as world No 1 and collected 45 ATP tour titles. 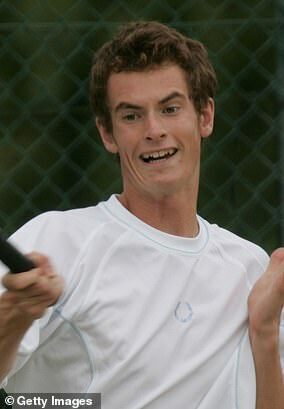 In 2002, Murray left home and went to train at the world-renowned Casal-Sanchez Academy in Barcelona for 18 months to develop his game. He first emerged onto the scene in 1999 when he won Florida’s Orange Bowl in his age group, one of the most prestigious junior tournaments in the world. He won it again two years later. 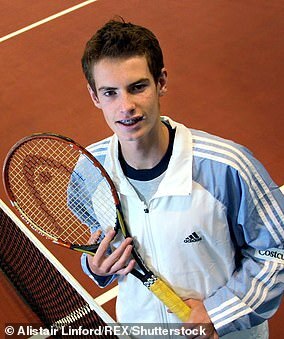 The following year, a teenage Sir Andy left home and went to train at the world renowned Casal-Sanchez Academy in Barcelona for 18 months to develop his game. The coaching appeared to work as in 2004 he became the world’s No 1 junior player. Sir Andy defeated Sergiy Stakhovsky to lift the U.S. Open junior title in New York City and later that year he received widespread acclaim, ending 2004 as the BBC’s Young Sports Personality of the Year. 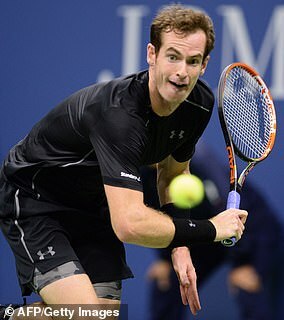 Sir Andy defeated Sergiy Stakhovsky to lift the U.S. Open junior title in New York City and later that year he was named as the BBC’s Young Sports Personality of the Year. 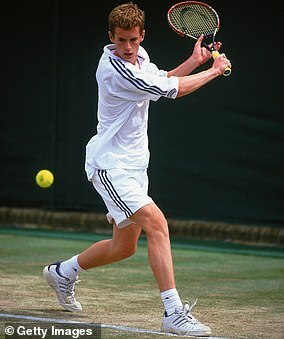 His rise through the ranks continued in 2005 when he became the youngest British player to compete in the Davis Cup, winning a doubles rubber against Israel. His rise through the ranks continued in 2005 when he became the youngest British player to compete in the Davis Cup, winning a doubles rubber against Israel. He turned professional that year. 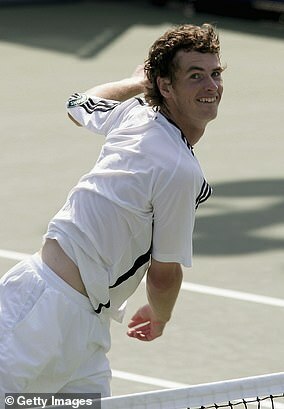 2006 proved to be a huge moment in Sir Andy’s breakthrough in the professional ranks. He first beat Roger Federer at the Cincinnati Masters before overcoming Andy Roddick on his way to winning the SAP Open in San Jose, his first ATP Tour title. 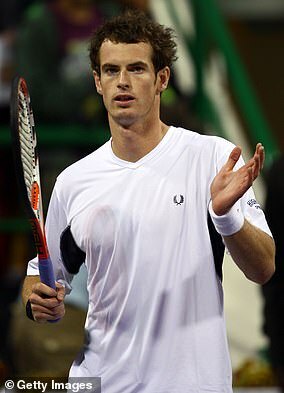 Sir Andy built on that success in California in 2007 by defending his crown while there was also success at the St Petersburg Open, which helped him break into the world’s top 10. He then made major progress at Grand Slam tournaments in 2008 when he made it through to the quarter-finals of Wimbledon. Later that year he beat Rafael Nadal to reach the final of the US Open before losing to Federer at Flushing Meadows. Those results propelled him to No 2 in the world in 2009 before more Grand Slam heartbreak occurred in 2010 and 2011, when he finished as runner-up twice at the Australian Open in Melbourne. 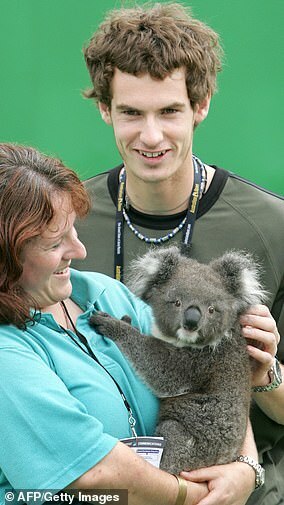 January 2012 proved to be a critical turning point in Sir Andy’s career. He hired eight-time Grand Slam champion Ivan Lendl as his coach and the Czech helped him to the next level. In July 2012, Sir Andy made it through to his first Wimbledon final and became the first British male to do so since Bunny Austin in 1938. 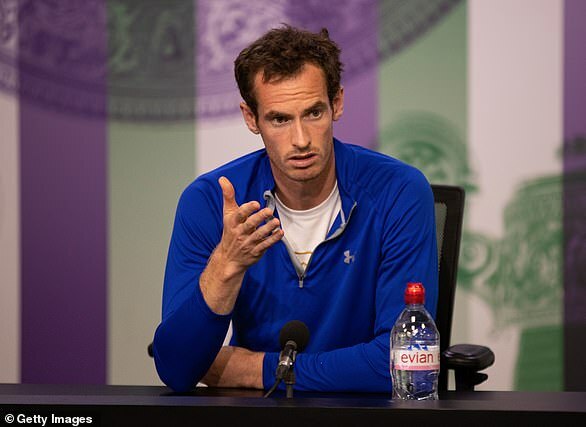 It proved to be a devastating occasion though as Sir Andy squandered a one-set lead to lose to Federer on Centre Court before being reduced to tears in his post-match interview. He earned redemption just four weeks later though when he claimed the Olympic gold medal at Wimbledon at London 2012 with a stunning straight sets win over the Swiss. There was further joy in the autumn as Sir Andy became the first player from Great Britain since 1977— and the first British man since 1936 — to win a Grand Slam singles title. He edged Novak Djokovic in a five-set thriller at the US Open. Sir Andy’s extraordinary 12 months concluded in the most fitting fashion as he finally ended his Wimbledon nightmare and made history. He once again edged Djokovic on the biggest stage to claim the men’s singles title at SW19. Sir Andy was the first British male to win the tournament in 77 years. 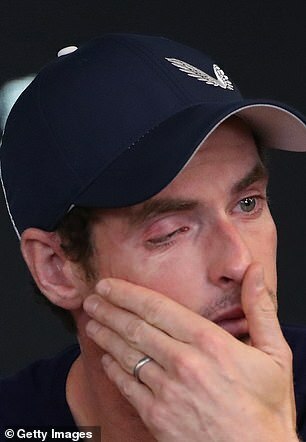 Sir Andy’s injury concerns began to linger in September 2013 when he was forced to undergo back surgery that forced his season to finish prematurely. 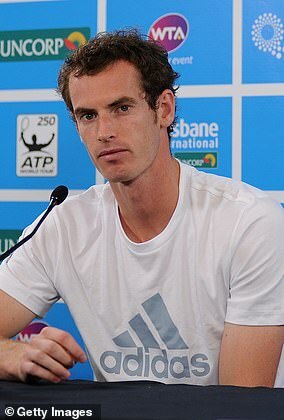 Upon his return, Sir Andy crashed out of the 2014 Australian Open in the quarter-finals and dropped out of the world’s top five for the first time since 2008. The successful partnership between Lendl and Sir Andy came to an end in March 2014 and the Scot replaced him with former women’s World No 1 Amelie Mauresmo three months later. Sir Andy seemed to be returning to his best when he made the Australian Open final in 2015 but was once again beaten when it mattered most. He endured further Grand Slam disappointment that year and lost in the semi-finals of both the French Open and Wimbledon before being knocked out in the US Open fourth round. While individual success was scarce in 2015, Sir Andy helped Britain end their wait for Davis Cup glory by inspiring Leon Smith’s side to victory over Belgium in the final. Sir Andy beat David Goffin in straight sets in the decisive rubber, handing Britain their first Davis Cup victory since 1936. Sir Andy picked up where he left off in 2016, reaching another Australian Open final only to be beaten once again by Djokovic. He also impressed at the French Open, eliminating defending champion Stan Wawrinka to become the first British player to reach the final at Roland-Garros since 1937, but ultimately came up short against Djokovic once more. 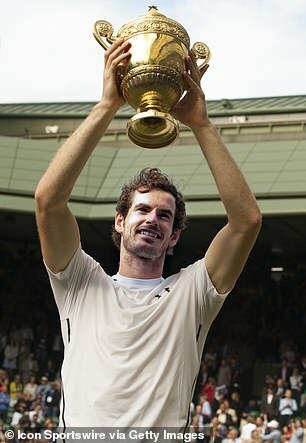 While there was disappointment in Australia and France, Sir Andy won his second Wimbledon title in the summer of 2016. 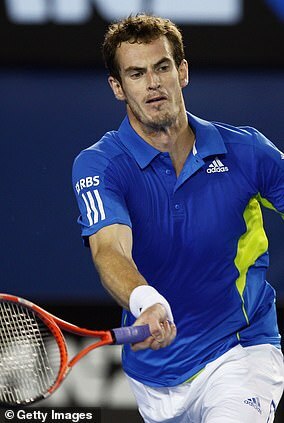 He eased past Canada’s Milos Raonic in straight sets to win his third and most recent Grand Slam title. There was more success just around the corner as Sir Andy beat Argentina’s Juan Martin del Potro at Rio 2016 to become the first male tennis player to successfully defend his Olympic singles title. 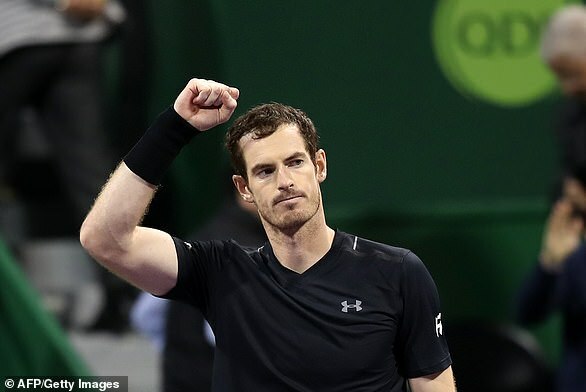 ATP Tour wins in Vienna, Shanghai and Beijing took Sir Andy to the verge of becoming world No 1 before reaching the final of the Paris Masters ensured the Briton dethroned Djokovic to reach the summit of the men’s game. Hip trouble has plagued Sir Andy since he began to feel the flare-up of a long-standing issue that had previously been under control in June 2017. Walking with a noticeable limp at Wimbledon 2017, Sir Andy battled his way into the quarter-finals but his title defence ended with a five-set loss to Sam Querrey. 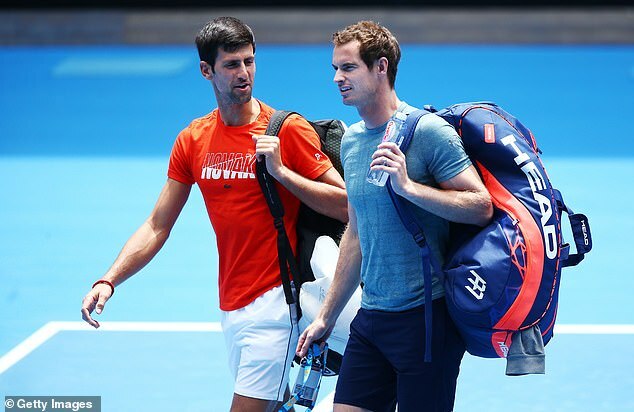 In January 2018, Sir Andy announced he had undergone hip surgery in Melbourne but just months later had suffered a setback in his recovery and was forced to take more time away from the court. In June, a lengthy 342 days since his last competitive outing, Sir Andy finally makes it back on court in the Fever-Tree Championships against Nick Kyrgios but loses his first-round match. Two days after Christmas and despite some time away since losing to Fernando Verdasco in Asia in September, Sir Andy admits the pain is still prominent as he prepares to play in the Brisbane International, a warm-up tournament for the Australian Open. In his last-16 tie against Russian star Daniil Medvedev, Sir Andy is comfortably beaten 7-5, 6-2 as fears grow over the condition of his hip. 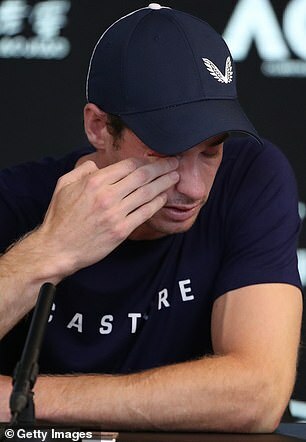 On Thursday, Sir Andy then left his Australian Open press conference in tears and suggests his time in Melbourne could be his last Grand Slam tournament due to the pain being too much to continue playing through.